At any age, routinely engaging in physical activity, especially in a natural outdoor environment, has shown to be effective at improving physical and mental health. Outdoor fitness centers inspire community pride, foster fellowship while providing the tools for a healthier lifestyle. 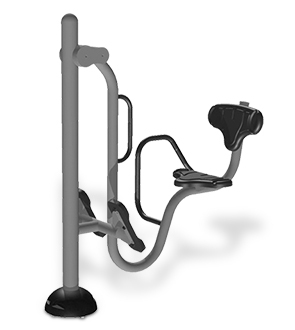 The Assisted Leg Press Station is designed to be a safe, low impact solution for strengthening the lower body and to help in maintaining fluid leg mobility. Designed for a comfortable and easy to use experience with padded comfort seat and back rest along with convenient assistance bars for secure entering and exiting. This piece of equipment also features a finely tuned isokinetic spring mechanism that dynamically converts the force generated by the user into an appropriate amount of resistance. Developed for outdoor use, the powder-coated all-steel Assisted Leg Press Station is popular for stand-alone installations and as a part of a comprehensive outdoor fitness centers. Providing opportunity for people of all ages and abilities to safely, easily and with convenience take the steps to a more active, healthy lifestyle.